Okay, I know I already declared my favorite winter recipe in my Pasta with Kale Pesto and Squash post...but am I allowed to have two? 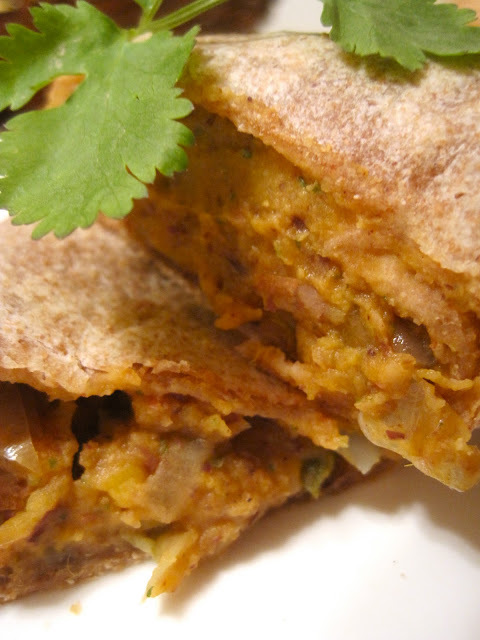 This Sweet Potato and Black Bean Burrito recipe is one of my absolute favorites; in fact it's what hooked me onto Mollie Katzen and her Moosewood Cookbooks. Brimming with flavor and stuffed (literally) with two Superfoods from WebMD's Top 10 List, these burritos contain the most affordable ingredients and are great to make in big batches and freeze for later use. What is a Superfood? Kathleen Zelman, MPH, RD, LD describes them as "multitasking" foods: providing disease-fighting nutrients, filling so you can enjoy lots of food without excess calories, and easy to include in everyday meals. Beans make the list because they are loaded with both insoluble and soluble fiber: the former which helps lower cholesterol, the latter which fills you up for portion control. Sweet potatoes owe their recognizable orange color to an abundance of vitamin A, and also contain large amounts of vitamin C, calcium, and potassium. In this recipe, the signature sweet flavor of the sweet potato contrasts beautifully with the spice of the chili pepper, coriander and cumin; each flavor is enhanced by a generous squeeze of lemon juice. A few time-saving tips for this recipe: microwaving the sweet potatoes (about 3 minutes, or until soft) instead of boiling and heating your tortillas in a pan with a quick spray of olive oil instead of baking them will eliminate over half the prep time. While the original recipe recommends serving with salsa- and I'm sure low-fat sour cream and guacamole would be fitting toppings as well- I love the flavor and texture of these burritos so much I personally prefer to eat them plain. 5 cups peeled cubed sweet potatoes I didn't peel mine because a lot of nutrients are concentrated in the skins! Preheat the oven to 350 degrees F. Place the sweet potatoes in a medium saucepan with the salt and water to cover. Cover and bring to a boil, then simmer until tender, about 10 minutes. Drain and set aside. While the sweet potatoes are cooking, warm the oil in a medium skillet or saucepan and add the onions, garlic, and chiles. Cover and cook on medium-low heat, stirring occasionally, until the onions are tender, about 7 minutes. Add the cumin and coriander and cook for 2 to 3 minutes longer, stirring frequently. Remove from the heat and set aside. 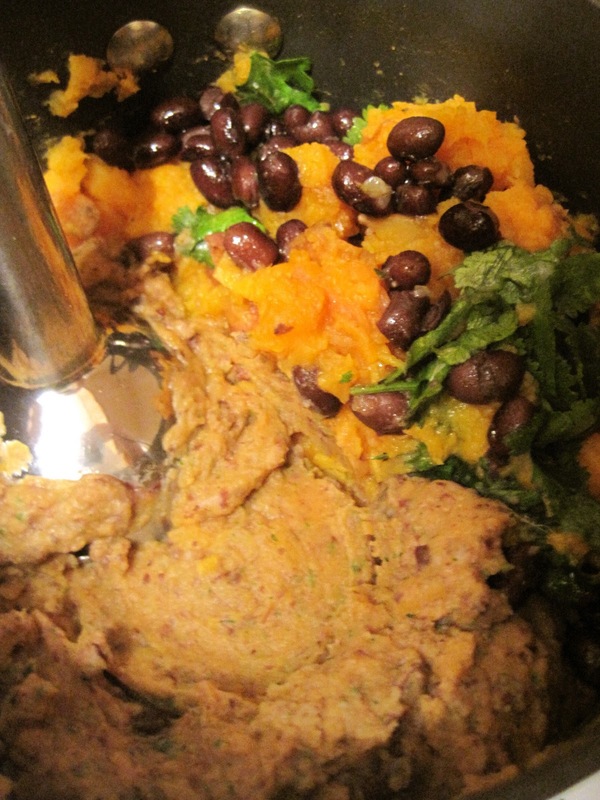 In a food processor, combine the black beans, cilantro, lemon juice, salt, and cooked sweet potatoes and puree until smooth. (You can also mash the ingredients in a large bowl by hand using a potato masher. The result will be a less smooth but nicely textured filling.) I used an emulsion blender; the texture was spot-on. Transfer the sweet potato mixture to a large mixing bowl and mix in the cooked onions and spices. Lightly oil a large baking dish. Spoon about 2/3 to 3/4 cup of the filling in the center of each tortilla, roll it up, and place it, seam side down, in the baking dish. Cover tightly with foil and bake for about 30 minutes, until piping hot. Optional: Serve topped with salsa. Zelman, Kathleen M. "List of 10 Super Foods for Your Diet." WebMD - Better Information. Better Health. Web. 17 Nov. 2011. <http://www.webmd.com/diet/guide/10-everyday-super-foods>.